The defense cybersecuirty market is expected to register a CAGR of 10.03%, during the forecast period (2018-2023). The defense industry has witnessed a dynamic change over the past decade. The growing advancements in information technology, upgradation of existing weapons with intelligence, surveillance, and increasing volume of classified data gathered from various systems have demanded the use of reliable and enhanced cyber security solutions for the defense industry. Further, with the increasing dependency of military organizations on the internet network, the frequency and sophistication of cyberattacks are on the rise. To counter all these vulnerabilities, there is a major focus on adopting cybersecuirty solutions in the defense sector. 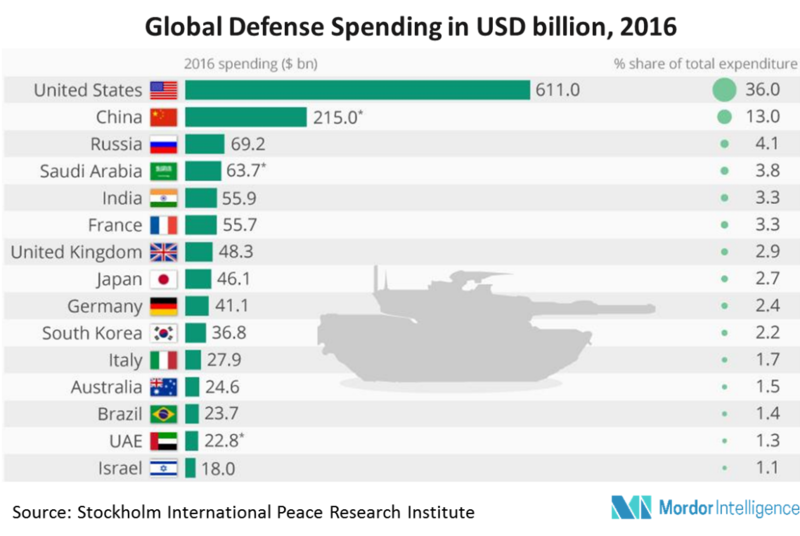 To keep pace with the modern defense advancements countries have developed new technologies, such as unmanned vehicles, hypersonic weapon among others. These advancements are highly dependent on the data and connectivity, making them susceptible to breaches and attacks. Thus, there is a growing necessity for the countries to focus on developing counter measures to safeguard critical information. The growth of the global arms and defense trade has also increased theft of intellectual property by other defense contractors to reduce their own research and development costs and further produce and sell new products at lower prices, to give them a competitive advantage in this market space. These situations have driven defense contractors to identify critical technologies and seek out vulnerabilities in these platforms. Though the defense budgets in North America and parts of West Europe are declining, the cybersecuirty market for the defense industry is expected to grow at a significant pace during the forecast period. This growth is driven by the investments in cloud network solutions for the battlefield management, data protection, and wireless security solutions along with development of network security & cloud security software. For instance, United States aimed to increase its National Nuclear Security by 3.3% accounting to 12.94 billion, to address the vulnerabilities of the countries defense capabilities. The market in Middle East particularly, Saudi Arabia, Qatar, and UAE are expected to witness the fastest growth, owing to the growing number of attacks on government network portals in Saudi Arabia and UAE in the past years have created the demand for the deployment of Unified Threat Management (UTM) cyber security solutions, cyber-attack alarms, and cyber intrusion prevention technology. Major Players: Cisco Systems Inc., IBM Corporation, Intel Security Group, Dell SecureWorks Inc., Symantec Corporation, Verizon Communications Inc., NEC Corporation, FireEye Inc., Fortinet Technologies Inc., Check Point Software Technologies Ltd. and Kaspersky Labs, among others.